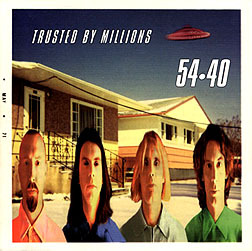 CD Review: 54-40, "Trusted by Millions"
Well, maybe not by millions, but certainly by a lot of Canadian popular music fans anyway -- but will they still trust 54-40 after listening to this latest release by one of Canada's premier bands? It's hard to say. My initial reaction to this CD was that I basically didn't have one. I had to listen to it several times before I could really form an opinion about it. There's nothing actually wrong with this CD. If you're a fan you'll like it because it's trademark 54-40: socially conscious lyrics ("Stick to Milly") and some fun stuff, too ("This is My Haircut," "I Love Candy"), all mixed together with hooky rhythms ("Cheer up Peru," "Love You All") and sharp-edged guitars. If you've never heard 54-40 before, you'll probably like this CD because it's got all the right goods: intelligent writing ("Crossing a Canyon"), with solid, tightly played music. The CD is well produced (with some help from Steven Drake of Odds), radio-ready and incorporates a variety of pop/rock styles. But if you're a reviewer, you'll probably be a bit peeved. Why? Because (trust me, as a 54-40 fan, it's killing me to say this) this release doesn't offer anything new. It's like they took what was light and popular from their early material, such as "Baby Ran" and "I Go Blind," shook it up with a little pinch of 1992's Dear Dear, then added some "Assoholic" and "Radio Love Song" from Smilin' Buddha Cabaret for a smidgen of punkier spice. Not an unappealing combination, yet hardly a creative evolution. Although I'm disappointed that this 54-40 release isn't exactly the opium I was hoping for, it still has somehow insidiously penetrated my musical psyche, forcing my fingers to once again, press that "repeat" button. Trusted By Millions certainly has the right stuff for radio and most probably, commercial success. If this was 54-40's mission, then a landing south of the 49th could be imminent.